Hola Amigas! December will be here in 2 days time..,and that means Christmas will be here in the blink of an eye. I have a craft fair this weekend. I have been busy creating, creating, creating. 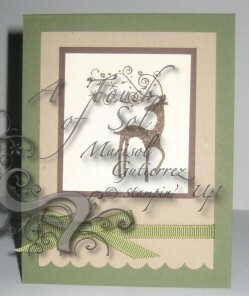 Here is one of the cards I created. This one is simple. I wanted to have a variety of stamping level cards. You can't tell in picture but the Very Vanilla is smooch spritz with gold. This card is BEAUTIFUL! If I do say so myself. This one I cased from Kathy. I also made bottle cap necklaces. I hope these do well. Solimar and Joaquin both liked them. Hola Amigas! Are you ready for Thanksgiving? I can't believe it's this week. Looking forward to GREAT company and GOOD eats! 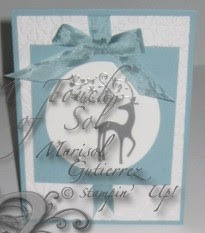 Well today I am sharing my 2nd project for USTAMP with Dawn and Friends. This session is Knockout Punches! LOVE, LOVE my color combo. This was a little difficult in that I haven't made a card set for USTAMP so had no idea what I wanted to make, let alone what punch art I was going to create...but am happy with the end result. What do you think? Hola Amigas! I can't believe we are in mid-November. What are your plans for Thanksgiving? Do you cook? I certainly do not. I bake...Same-Difference, right? Here are some fall Thank Yous I made for my hubby. I always have to use Real Red, Basic Black and Whisper White. So it DAMPENS my mojo. I cased this from Mary Fish. The only difference is my hubby didn't want any of the brads nor did he want fish tails on the ribbon. I did end up changing the ribbon from satin to grograin. Hola Amigas! Today we are going to meet Santa (the NY Macy's Day Santa) at Rutgers University. He came to visit an event my hubby was giving for his program. I made the following for a basket. There was quite a few baskets that attendees got to put tickets in to win them. I was happy to see alot of tickets in my bucket. 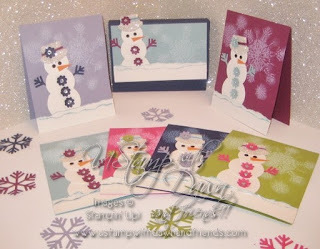 I made the a box of the Season's Greeting cards. 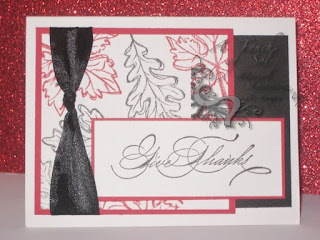 On the card I used the technique Dazzling Diamond Dust. 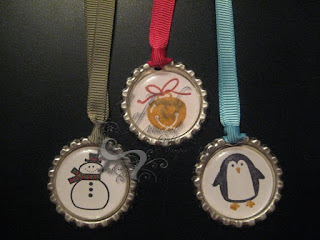 I used the technique on the Nugget Tin Band as well as the Bookmarks. Had I had more time to put something together I definitely would have added more.